It is late. The streets that were crowded with people, animals, and soldiers during the day are now deserted. Suddenly the silence is broken by the cry of a newborn baby. A new life has entered the world. Not just any life, but one that has been promised for centuries. This life is God’s gift to mankind. For over 2,000 years this baby’s birth has been celebrated. This celebration takes many forms, but there is one thing that is peculiar about this celebration. People from all over the world celebrate this baby’s birth except the people of the baby’s home country. Christians of all ethnicities and denominations gather each year from mid-December to mid-January to celebrate the birth of Jesus in the little town of Bethlehem in the small country of Israel. For the most part the inhabitants of the town look on as the world celebrates selling food, nativity scenes, crucifixes, and other wares in street bazaars encouraging the Christmas tourists to leave some of their money in the little town in a little country. Other inhabitants may participate in the celebration. Some may participate for the fun of it. Some join out of curiosity, and others to worship. Most Christians visiting the Holy Land during Christmastide celebrate on December 25, but Eastern Orthodox Christians celebrate on January 6. On December 24 the Roman Catholic Latin Patriarch of Jerusalem leads a procession from Jerusalem to Bethlehem, approximately 5 miles, to the Church of the Nativity. The Church of the Nativity was built in AD. 325 by Roman Emperor Constantine and rebuilt in the 500s by Emperor Justinian. The church houses the Grotto of the Manger. The Grotto is about the size of a railroad car illuminated with many candles. Incense is burned until the air is thick with it. 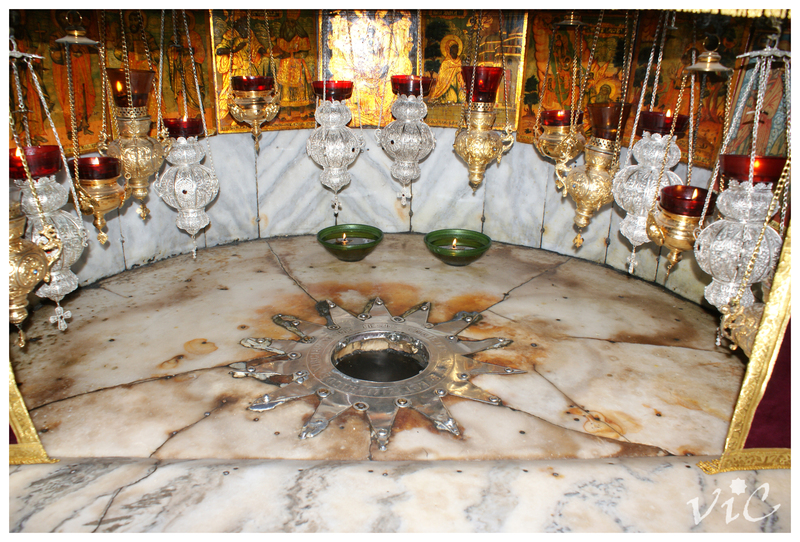 A fourteen-point silver star marks the place believed to be the spot of Jesus’ birth. The grounds of the church also houses St. Catherine’s Roman Catholic Church, an Armenian Monastery, as well as churches and buildings of other faiths. The Roman Catholic Christmas Eve service begins late in the evening with bell ringing, impressive choirs, and a solemn High Mass. After midnight, Catholics leave mass and proceed to the Grotto of the Manger where an effigy of the Christ Child is placed on the silver star. Then they return to St. Catherine’s to finish the service. Other denominations and faiths holding services on December 24 also visit the Grotto. Protestant Christians tend to meet in one the field outside Bethlehem where, according to tradition, the shepherds heard the angels proclaim the Lord’s birth. Roman Catholics and Eastern Orthodox Christians may also meet in rival shepherds fields. At these meetings choirs lead the worshipers in singing Christmas carols filling the night sky with beautiful music reminiscent of the angelic choir that first Christmas. Picture this. The house is brightly decorated with greens and candles. There’s a fire in the fireplace. The kids are playing with their gifts in front of the tree ornamented with lights, tinsel, and all sorts of bright baubles. Christmas carols are playing in the background. Laughter is heard as the adults relax and get caught up with each other. Every room is perfumed by the wonderful food that was the Christmas feast. Sound like your Christmas family reunion? Probably not. There is so much that has to be done before the gathering. The hostess has to clean and decorate the house, plan the menus, buy all the food, and coordinate schedules. The guests have to buy and gather gifts, make arrangements for pets, make financial and travel arrangements, pack, stop mail and other deliveries, and secure the house. Then comes the gathering. The house is rarely big enough for everyone attending so inconveniences are sure to crop up. The hot water runs out before the showers are finished. There’s always a line for the bathroom. The children are noisy. Some people stay up too late, while others get up too early. And the kitchen seems to always need cleaning. How people react to each other during these inconveniences determine whether the celebrations goes well or not. People expect the Christmas celebration to bring everyone closer together. They fail to realize, however, that no family reunion is perfect. Everyone brings baggage to the reunion, family squabbles, neighborhood spats, and even office politics. If this baggage isn’t checked at the door, tensions at the gathering may run high. Non-traditional families have other issues. Singles, because of movies, television, cards, and their own ideal Christmas, see Christmas as a time for couples or families to be together. Single parents face Christmas with a missing partner; their children missing a father, or mother. How can we survive the Christmas homecoming? Concentrate on the people and the celebration, and you’ll find your enjoyment of the celebration enhanced. You can also anticipate as many problems as possible and take steps to deal with them before they occur. The exercises below will help you prepare for this year’s Christmas family reunion. No family is perfect, but if you can accept your family as it really is, you’re going to have a more enjoyable celebration. This first exercise helps you take a look at your family members and explore your hidden expectations for them. 1. In the space below, write down the names of family members that you have complicated or mixed feelings about. Leave a blank space after each name. 3. If you have little reason to believe that people are going to change the characteristics that bother you, look again at each person’s name and tell yourself, “I accept the fact that this person will probably . . . ” filling in the way that person will most likely behave. Mary did this part of the exercise and told herself that she would try to accept the fact that her father often drank too much at Christmas. She realized that her mother chose to be so busy and that, even though any number of people offered to help her, she was running the show. Her sister Louise had always talked too much and always would. And her brother Mark often backed away from the family, probably for the very reasons that she did. While she experienced some disappointment in realizing these things about her family, she felt clearheaded about what the visit would be like. 4. Now think of one thing that you especially like about each of the people on your list. Write those desirable qualities down by their names. When people are able to focus on their family strengths and not dwell on their weaknesses throughout the holiday season, they find that Christmas is many times more enjoyable. Whether you have specific family problems or not, this exercise will make you more aware of your family’s strong points. Read the following statements. When a statement is a great family strength, mark it with a star. If it is a lesser strength, mark it with a check. Leave it blank if it does not describe your family at all. We have common spiritual beliefs or accept each other’s different beliefs. We know how to have fun together. For the most part, we communicate with each other well. We openly express our love and affection. We have similar life-styles and values or accept each other’s differences. We do not have serious money problems. We have common Christmas traditions or make a special effort to respect our differences. We have compatible styles of child-rearing. We don’t have serious alcohol problems. Christmas is for children. They add so much joy and excitement to the Christmas celebration. As we watch our children we remember forgotten childhood memories of Christmases long past. The magic of Christmas returns as we enjoy Christmas with our children. Children also give us a chance to examine our holiday activities, which ones to keep and which ones to drop, and start family traditions. With all this joy children also bring added concerns. Children, it seems, become preoccupied at an early age with receiving gifts. This preoccupation, along with the myriad commercial pressures, make it difficult for parents to create a simple, values-centered family Christmas. We’ll attempt here to alleviate these concerns. We agree that children really don’t need all the toys and gifts they claim to want. They don’t want them either as evidenced by their boredom hours after receiving the gifts. So what do children really want and need for Christmas? Children need a relaxed, loving time with family. This means more to them than a tree loaded with gifts. Yet it is much more difficult to provide. With all the added work, planning the Christmas celebration, decorating the tree and the house, cleaning the house, and shopping for gifts, one of the first things to get pushed aside is spending time with the children, with the family. It is important for families to set firm priorities even if it means not participating in other activities. Each December I set aside one Saturday with my children baking cookies and making fudge for Christmas giving and eating. I found that if I didn’t decide ahead of time which Saturday was baking day, we would lose that special time together. Children need realistic expectations about gifts. Many children go through the toy catalog as soon as it arrives in the mail marking every toy they want. “I want that,” follows each toy commercial whether the child likes the toy or not. If the focus of a child’s Christmas is gifts, they experience a sharp let down when the gift giving is done. Parents need to get their children excited about other aspects of the Christmas celebration and spread that excitement throughout the entire season. Establishing value-centered family traditions help lessen the focus on gifts. Instead of the fast-paced holiday season, children need a slower, evenly-paced season. In the 1800’s Christmas had a much shorter buildup time. Many people didn’t start preparing for Christmas until mid-December, but their celebration lasted for a week or more. Even as short as twenty years ago the Christmas season didn’t begin until the day after Thanksgiving. Now the preparing for Christmas begins before Halloween and the celebration ends midnight Christmas day. Consider holding off your traditions until a week or so before Christmas or doing one or two traditions a week between Thanksgiving and Christmas and continuing the celebration through New Year’s Day or Epiphany, January 6. Slowdown the pace of your holiday season. Your children with thank you. Children want to look forward to the same events happening every year. In my house, my children look forward to watching as many of our Christmas DVDs and videos as possible, baking cookies, including frosted sugar cookies, doing the advent calendars on the VeggieTales and Garfield websites (www.bigidea.com and http://www.garfield.com), tracking Santa on Norad’s Santa Tracker website (www.santatracker.com), and reading the Christmas story before opening gifts every year. I’m sure I’ve forgotten some things we do, but you get the idea. With these traditions that we’ve established, my children have the chance to do something they enjoy every year. Strong traditions give children a sense of comfort and security. They know that in an ever changing world these Christmas activities will always happen. These traditions don’t have to be elaborate. Simple activities will suffice. As you can see from my list, none of the activities are exacting. They don’t cost a lot of money. Ask your children what they would like to do to celebrate Christmas. They can help you know what traditions to keep and what traditions to eliminate, or at least do less often. Children, they can add so much to the enjoyment of the Christmas season. They can also add many concerns. The exercises that follow will help you help your children enjoy Christmas this year and every year. 1. Of all the needs of children at Christmas, enjoyable time with their families is most important. Think back to last December. Excluding Christmas Eve and Christmas Day, did you spend (underline the correct word) more, about the same, or less happy, relaxed time with your children in December, compared to other months? 2. If your answer to the above question was “less,” look through the following list and check the suggestions on how to spend more time with your children that seem most feasible for you. 4. What holiday traditions or family activities do you children have to look forward to after December 25? (If you have none or very few [try some of the] suggestions [listed after the exercises]. It is by far the most important tradition. It is one of several important traditions. It is of moderate importance. It is of relatively minor importance. 6. On a sheet of paper, write each of your children’s names and jot down a few sentences that describe his or her attitude toward Christmas presents last year. (If one or more of your children seemed overly concerned with gifts, you may wish to review this [blog]. Celebrate each of the twelve days of Christmas with simple activities geared for children. Create a family calendar for the month of December showing when things will be done. Put together a puzzle or play games. eaten until the tree is taken down. Celebrate the new year with family games and activities. Many men just can’t get excited about Christmas. Their women wish they would. preparing for the Christmas celebration. Christmas preparations. Sure they provide emotional and financial support. for men to get excited about Christmas. like. Christmas loses the familiar, comfortable aspects that men grew up with. old pair is rarely recaptured. production. Someone on the outside looking in. participant, from the gopher to a co-planner. in, adding those that we have overlooked. shows how much you enjoyed doing it last year. A 10 shows the most pleasure. 3. Think about what, overall, gave you the greatest pleasure last Christmas. 4. Which activities or situations gave you the least pleasure? occasions were particularly pleasurable for you? A. My wife determines nearly all of the holiday events. B. My wife determines more of the holiday events than I do. C. We share the planning fifty-fifty. 2. How do you feel about this arrangement? you determine how to make Christmas 2013 a memorable and joyous celebration. time. It’s no wonder that Christmas is so stressful and busy for so many. of the joy many expect to experience at Christmas. beauty to the Christmas celebration? relax and enjoy each other suffers. Over the next few weeks we’ll be exploring the answers to the above questions.